The Washington Nationals haven't pulled the trigger on star pitcher Stephen Strasburg, they've put the gun on safety and packed it up until next hunting season. After pitching slightly more than 159 innings, the team and manager Davey Johnson have pulled a Roberto Duran and said "no mas". As you recall, Strasburg is coming off 'Tommy John' surgery and the club had made the decision earlier in the season to allow him to pitch only around 165 total innings. This decision comes on the heels of a terrible outing where Johnson didn't feel Strasburg had his head in the game. Seeing as how the Miami Marlins shelled him for 5 runs in 3 innings , I don't think he had much else in the game either. 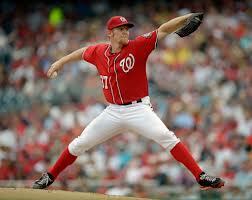 Strasburg gives up the fight with his National holding a 6 1/2 game division lead over the Atlanta Braves. I'll admit I don't know much about TJ surgery, stress and strain caused by the throwing motion, or rest/work between starts. Having admitted that, when Washington arrived at the September part of their schedule, why not sit Strasburg out through the entire month? Their Eastern Division lead at that juncture was 7 1/2 games, so the playoffs were a reasonable assumption whether by winning the division or entering as a wild card team. Then they could have brought the guy back for the playoffs and still not exceeded the 165 innings total. That probably would not have messed his head up so badly as well, not to mention the fact it would have made the Nats much stronger contenders for a title.